A Beijing Capital Airlines (JD) plane was performing flight JD5180 from Changsha to Sanya on Monday afternoon when the flight attendants noticed a woman trying to open the emergency door. When cabin crew stopped the passenger, she threatened to commit suicide on the plane. A scuffle then broke out in which two other passengers joined the woman in fighting the crew. Capital Airlines confirmed the incident, but said the airport authority was still checking the details. The suspects are now being held in pre-trial detention on the grounds of endangering public safety. 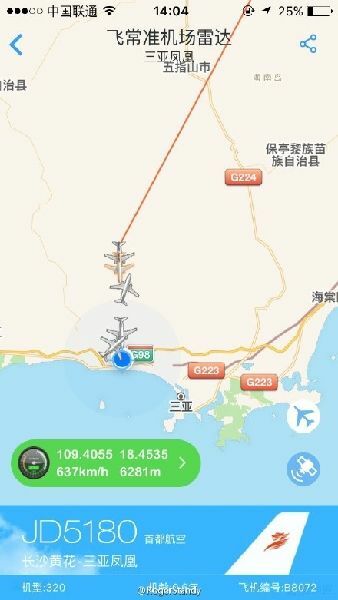 According to VariFlight, China’s leading flight status service provider, the flight JD5180, performed by an Airbus A320 aircraft (Registration B-8072), took off from Changsha at 12:05 p.m. and landed safely at Sanya Phoenix International Airport at 2:11 p.m.